Base bottom panels are ⅜" thick. Adjustable shelves exceed industry standards with ⅝" thick multi-ply hardwood Plywood & edge banded with wood tape. 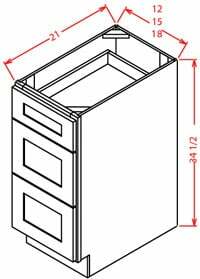 ⅝" solid hardwood drawer front, back and 2 sides with plywood drawer bottoms. Dovetail construction. Soft-Closing Under-mount Full Extension Drawer Glides.